If you can’t get to Norway to view or purchase beautiful woven textiles, you have an equal opportunity this month in Minneapolis. 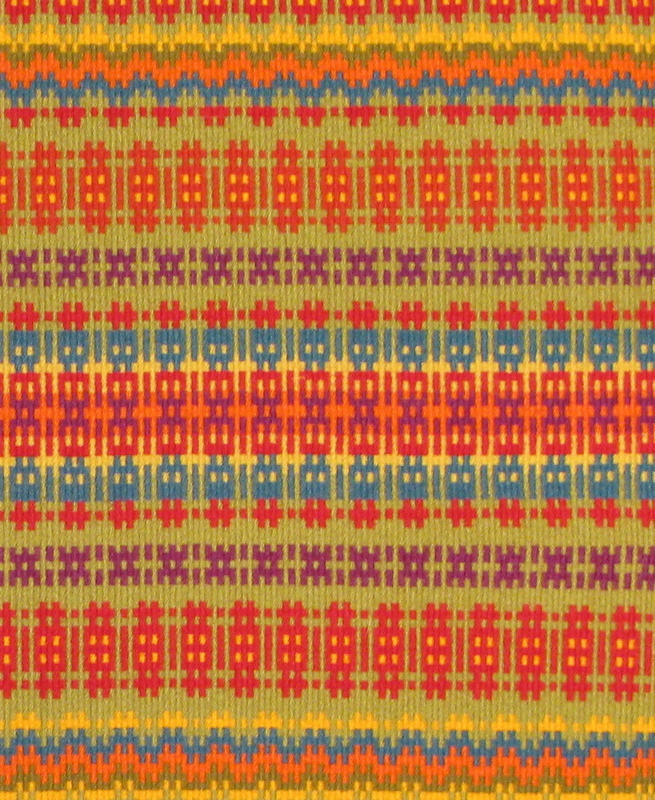 The Scandinavian Weavers Study Group, part of the Weavers Guild of Minnesota, is displaying a selection of woven textiles through Christmas in the gallery of the Unitarian Society of Minneapolis. The Scandinavian Weavers Study Group has been meeting for more than twenty years, providing a consistent forum for the study of traditional Scandinavian weaving techniques. The members weave traditional patterns and also use the weaving techniques and pattern elements for modern expression. The group studies a particular technique each year, most recently concentrating on boundweave techniques, in which the warp threads are covered, or bound, by the weft. Many of the pieces in this show are woven in krokbragd, a three-shaft technique that yields pieces with an immense range of points, squares, and linear elements. Most pieces in the current show are woven with wool, primarily Norwegian yarns. They hold the connotations of traditional textiles – warmth, the multi-generational appeal of folk patterns, and ethnic identity. On the other hand, the weavers’ personal design and color choices, and high craftsmanship, result in abstract art pieces. Maybe you can’t get away to a “hytte,” a Norwegian cabin, this Christmas. But you can admire many weavings that would be perfectly at home in that setting, as well as in our contemporary Minnesota homes. Download a flyer for the exhibit. I so wish that I was closer! The weaving looks exciting. Can you tell me from just where one can obtain Norwegian yarn? Do I correctly assume that it is of a tight twist & from spelsau sheep? Many thanks. I am inspired to weave!